This year is shaping up to be a busy writing period for me. Below is the list of books I'm working to release this year and in 2020. Now available to the below channels. Ecstatic. My story, To Like A Man, ranked fifth in Webnovel.com's LGBT writing prompt based on popularity. Excited for this result since it's the first time I've received something of award recognition for my writing in the decade I've been slaving away on the craft. To have ranked for LGBT is a sweet victory. Here are some of the verbatim Zaldizko has received. Dare original and see what the talk is all about. Some glowing reviews from awesome readers and writers at Webnovel.com. I'm hoping that the rating will eventually show on the sites rating list. It only needs two more to flick the sites switch. 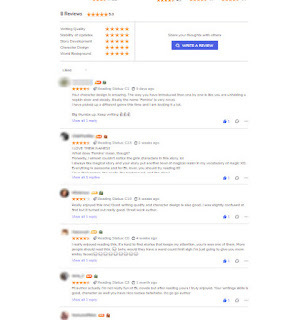 It also received a surprise 5 Star rating at Royal Road that is boosting Google's book impression. I swear it wasn't by me. At Wattpad, some verbatim left as comments to posts. Below is what some have said about the Prologue. I'm a very happy cat with all the story love I'm receiving for this one. Zaldizko holds a special place in my heart since it has taken me so long to write and finish the story. Read original. Dare original today! I've decided to discontinue updating to Webnovel and continue using Wattpad as my sole platform for upcoming works. I've left whatever I've posted there (although I had to delete posts from one of the books because I messed it up) with a disclaimer. I'm currently testing Royal Road again with Zaldizko, although I also feel my stories wouldn't do well there too since I've noticed a lot of stories posted there are LitRPG, fantasy and romance. Very similar to Webnovel. I'm not sure how receptive they would be to boys' love action fantasy. 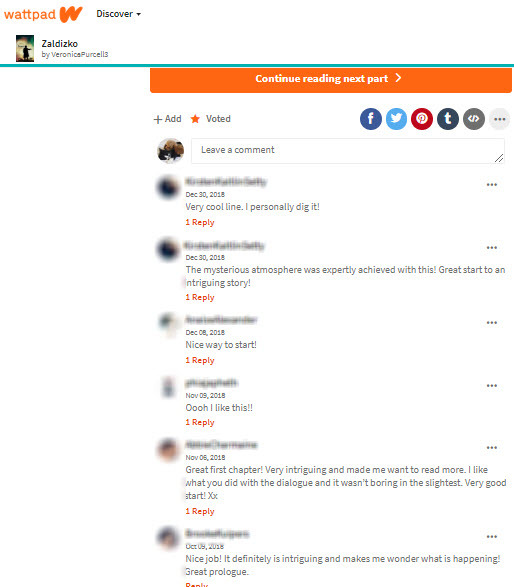 So, I'll stick with Wattpad since it really does have the diverse range of readers that sort of fit my story style. It also holds the largest amount LGBT story sharing content online too. Yet I'm not that popular there either. I'm really your left field niche author who gets small luck from time to time. It would be go if one day I write something ground breaking. Right now, my words are too weird for most tastes.